One of the things I love about the weeks following Christmas are the opportunities to use gift cards that I received. Love, love the gift cards. But before I set out on this particular shopping excursion, I decided that the items I bought had to be a combination of fun, functional, and self-indulgent. Dying to know what I bought? I've sworn by The Body Shop's Body Butter for years, so I thought, "Why not try the hair butter?" First, the tree hugger in me loves that it's environmentally friendly. Secondly, my hair just like my skin, becomes very dry in the winter. Something that moisturizes a bit more than conventional conditioner is needed. However, Hair Butter is not intended for daily use. 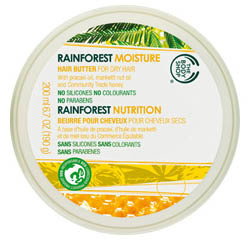 I've been using it 3 times per week, and that frequency seems perfect for replenishing my hair with additional moisture. My hair is definitely softer and shinier. A 1.76 oz. container retails for $8. 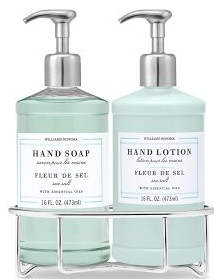 Part of Williams-Sonoma's Essential Oils line, the Fleur de sel scent is light and refreshing. Think seaside fresh. I also bought the candle. It makes me yearn for summer. The soap/lotion combination retails for $40. The candle costs about $20. These have become my go-to earrings. 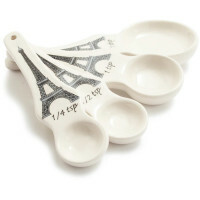 I wear them with everything! I especially love how they immediately dress up a ponytail. They can make a basic black turtleneck and a ponytail look dressy. 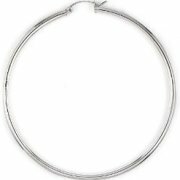 Silver hoops range in cost from $4.50 to $10.00 depending on size. Banana Republic was recently offering 50% all sale merchandise. When I saw this top, I immediately fell in love. It was $42.99 plus an additional 50% off. I had to buy it. I've worn it with sweaters and a jacket. It would look super cute with a white top underneath and and black belt around the waist. I can't wait until the warmer weather sets in so that I can wear it alone. Just knew I had to have these when I saw them. How adorable are they? I write down EVERYTHING. Everything. So, it's important for me to have a central place to keep all of my notes. When my 4 year old recently got a hold of my beloved Eiffel Tower notebook and wrote on every. single. page, it was time for a new one. Yes, this one is being kept out of harm's way as I don't need adorable stick people invading my lists and notes. Don't you just love the color combination? I adore it. 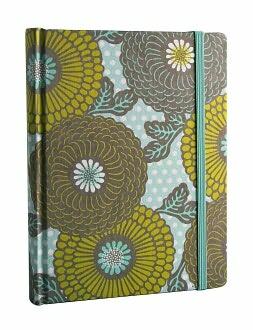 Journal retails for about $20. So these are a few of my favorite new finds. What have you bought for yourself recently? Care to share? I'd love to know. Disclosure: I received no compensation from any of the aforementioned brands. These are products that I love and wanted to share my thoughts with the readers of Pieces of a Mom.